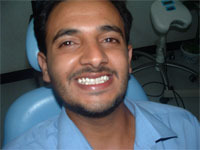 Laser Teeth Whitening is a cosmetic dental procedure performed in a dental office. Teeth appearance is an important part of your smile and the way you look in general, that's why many people turn to teeth whitening to improve the look of their teeth. Laser teeth whitening has become one of the most popular options for tooth bleaching, because it's very effective and produces immediate results. Laser teeth whitening is usually done in a single visit to a dental office. The laser whitening starts with a clean up of the patient's teeth, followed by applying special teeth whitening gel to the teeth. This whitening gel contains stronger bleaching agent compared to the gel used in over-the-counter tooth bleaching products, which ensures better results. 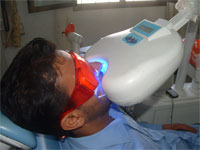 After the whitening gel has been applied, the dentist uses special laser light, which facilitates better gel penetration through the teeth enamel. 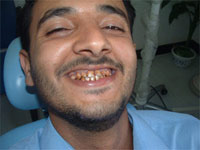 The teeth whitening procedure usually last about an hour and the results can be seen immediately after. Laser teeth whitening is very effective, and produces better and faster results compared to other teeth whitening methods. Depending on the patient's teeth shade and condition, laser teeth whitening can whiten teeth up to 8 shades. The laser teeth whitening costs will vary greatly depending on the exact procedure performed (how many visits would it require and the degree of whitening that needs to be achieved) and where you live (if you live in expensive area, you might expect higher laser teeth whitening costs). In general you can expect to pay anywhere from several hundred dollars to several thousands for a complete laser teeth whitening treatment.